Vaccinations for children under five have been suspended in Australia. Many children have been hospitalised with febrile convulsions within hours of the shot. Febrile convulsions are fits associated with a high temperature. A baby just one year old is still in a coma in a Perth hospital. Other reactions to the vaccine have been fevers and vomiting. 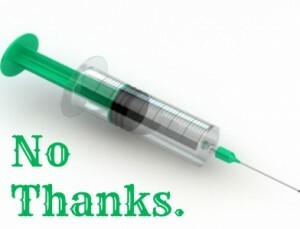 And this is for a vaccine even the experts say is ineffective: New Study – Flu Vaccine Doesn’t Work. There have been numerous studies which CHS has reported previously numerous times – see links below or CHS Site Map for other reports]. Australia’s chief medical officer Jim Bishop today said health professionals should immediately stop immunising children under five years old with the flu vaccine. Professor Bishop is concerned about a spike in the number of West Australian youngsters experiencing fever and convulsions after getting the shot: “Don’t give children flu jab: chief medical officer“ Syndey Morning Herald April 23, 2010.